For other uses, see Santa Fe Trail (disambiguation). 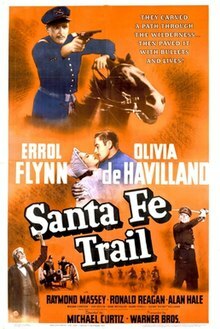 Santa Fe Trail is a 1940 American western film directed by Michael Curtiz and starring Errol Flynn, Olivia de Havilland, Raymond Massey, Ronald Reagan and Alan Hale. Written by Robert Buckner, the film is about the abolitionist John Brown and his campaign against slavery prior to the American Civil War. In a subplot, J. E. B. Stuart and George Armstrong Custer compete for the hand of Kit Carson Holliday. The film was one of the top-grossing films of the year, and the seventh Flynn–de Havilland collaboration. Its content has little relevance to the actual Santa Fe Trail. The film is not to be confused with the Raoul Walsh movie They Died with Their Boots On, released the following year, in which Flynn plays Custer, also with de Havilland as his leading lady. At West Point Military Academy in 1854, cadet Carl Rader (Van Heflin), an agent of John Brown, is dishonorably discharged for distributing anti-slavery pamphlets. His classmates Jeb Stuart (Errol Flynn) and George Custer (Ronald Reagan) become second lieutenants and are posted to Fort Leavenworth, Kansas Territory, the most dangerous duty in the army—an assignment they relish. On the way to Kansas, Custer and Stuart meet Cyrus K. Holliday, in charge of building the railroad to Santa Fe, New Mexico, and his daughter Kit (Olivia de Havilland), with whom both officers fall in love. The Kansas Territory is bloodstained and war-torn, a victim of John Brown's (Raymond Massey) relentless crusade against slavery. Meanwhile, Rader has enlisted as a mercenary in Brown's army, which has been terrorizing the countryside. 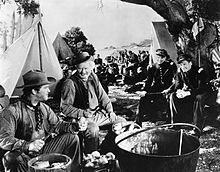 During Brown's attack on a freight wagon under the protection of the U.S. Army, Stuart and Custer capture Brown's injured son Jason (Gene Reynolds) and, before he cursed, the troubled boy informs them about his father's hideout at Shubel Morgan's ranch in Palmyra. In disguise, Stuart rides into Palmyra, the center of the Underground Railroad, but Brown's men spot his horse's army brand. He is captured and taken to Brown at gunpoint. Attempting to escape, Stuart is trapped in a burning barn but is saved as Custer leads the cavalry to the rescue, driving Brown into seclusion. Three years later, in 1859, believing that Brown's force has been broken, Stuart and Custer are sent back to Washington, D.C., where Stuart proposes to Kit. However, Brown is planning to re-ignite war by raiding the arsenal at Harper's Ferry, Virginia. When Brown refuses to pay Rader for his services, Rader rides to Washington to alert Stuart of Brown's plans, and the troops arrive just in time to crush the rebellion. Brown is then tried for treason by the state of Virginia and hanged. The movie ends with the marriage of Stuart and Kit. Massey's John Brown eagerly endorses breaking apart the union of the United States. The movie was made on the eve of the United States' entry into World War II, and its tone and political subtext express a desire to reconcile the nation's dispute over slavery which brought about the American Civil War and appeal to moviegoers in both the southern and northern United States. The American Civil War and abolition of slavery are presented as an unnecessary tragedy caused by an anarchic madman. The heroic protagonists such as Flynn's Jeb Stuart and Reagan's Custer seem unable to conceive how the issue of slavery could place them at odds in the near future, even though by 1859 hostility between the pro/anti-slavery states had reached a boiling point. Black people are presented as passive and clueless; slaves brought by John Brown's Underground Railroad to the North are merely following orders of the abolitionists, without any motive to flee slavery. They muse about the good old times when they lived happily in the south. Trapped in a burning shed, they need to be rescued by a white man. Stuart and Custer did not attend West Point at the same time and were never personally acquainted. Stuart graduated from West Point in 1854 and Custer graduated in 1861. Jason Brown was not killed in Kansas. One of Brown's other sons, Frederick, was shot by Reverend White. Stuart served in the 1st Cavalry Regiment and Custer served in the 2nd and 5th Cavalry Regiments. Custer was never in Kansas Territory (although stationed there after the Civil War and after Kansas had become a state). Carl Rader did not exist. The film was based on a script by Robert Buckner. At one stage Randolph Scott was mentioned for the lead. However by April 1940 it had become a vehicle for Errol Flynn and Olivia de Havilland. John Wayne was mentioned as a possibility for Flynn's costar. Dennis Morgan was originally announced for the role of George Custer. Morgan was borrowed to appear in Kitty Foyle and was replaced by Ronald Reagan shortly before filming began. Van Heflin was signed to play the villain following his success on Broadway in The Philadelphia Story; it was his first movie since 1937. Filming started in July 1940, delayed by a recurrence of Flynn's malaria. Outdoor scenes were filmed at the Lasky Movie Ranch in the Lasky Mesa area of the Simi Hills in the western San Fernando Valley, California. The film was premiered in Santa Fe over a three-day festival, featuring a large number of celebrities, including Flynn, De Havilland, Rudy Vallee and Wayne Morris. Rita Hayworth performed a "welcome dance". There were 250 guests and two special trains, one from Hollywood and one from the East, for a total cost of $50,000 — shared between Warners and Santa Fe Railroad. De Havilland was stricken with appendicitis during the trip and had to be flown home. According to Warner Bros records, the film made a profit of $1.48 million. It made $1,748,000 domestically and $785,000 foreign. The film was released in France in 1947 and recorded 2,147,663 admissions. In its initial release, Warner Brothers premiered this film in some large cities with an experimental sound system called Vitasound, not stereophonic but aiming to create a greater dynamic sound range for battlefield action and dramatic music. Santa Fe Trail entered the public domain in 1968 when United Artists Television (then the owners of the pre-1950 WB library, inherited from Associated Artists Productions) did not renew the copyright. As a result, the film became widely available on VHS, LaserDisc and DVD as well as freely available for internet downloading. In 1988, a colorized version was produced by Color Systems Technology for Hal Roach Studios, and released on VHS (VidAmerica, 1990). Turner Entertainment also released a higher-quality VHS than was previously available (MGM/UA Home Video, 1998). Today, Turner's library is part of the television division of Warner Bros., the original distributor. Though not fully restored, higher-quality editions have more recently been released in Germany on DVD (Intergroove, 2011) and Blu-ray (WME Home Entertainment, 2017). ^ Glancy, H. Mark. "Warner Bros film grosses, 1921–51". Historical Journal of Film, Radio and Television. March 1995. 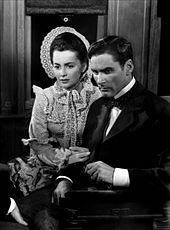 ^ "'Santa Fe Trail' Finds Errol Flynn as J. E. B. Stuart: Hollywood on the Trail of the Fifties By Frank Daugherty Special to The Christian Science Monitor". The Christian Science Monitor (1908-Current file) [Boston, Mass] 9 August 1940: 2. ^ 1948-, Reynolds, David S., (2006). John Brown, abolitionist : the man who killed slavery, sparked the Civil War, and seeded civil rights (1st Vintage books ed.). New York: Vintage Books. ISBN 0375726152. OCLC 75966355. ^ Churchill, Douglas W. "Screen News Here and in Hollywood: Randolph Scott Gets Lead in 'Santa Fe' That Warners Listed for Errol Flynn. Mae West Picture opens: 'My Little Chickadee,' in which W. C. Fields is co-starred, at the Roxy Today. Special to The New York Times, (1923-Current file) [New York, N.Y] 15 March 1940: 27. ^ Schallert, Edwin. "Howard, Drew to Share Spotlight in 'Rangers'". Los Angeles Times 13 April 1940: 14. ^ Parsons, Louella O. "Close-Ups and Long-Shots Of the Motion Picture Scene". The Washington Post 25 June 1940: 11. ^ Power, Darnell Attain Third Feature as Team Schallert, Edwin. Los Angeles Times 1 July 1940: A10. ^ News of the Screen: Van Heflin Signed for Villain in 'Santa Fe Trail' The New York Times 6 July 1940: 9. ^ Schallert, Edwin. "John Garfield to Play Nijinsky Role on Stage: Moreno 'Sinners' Actor Roland 'Cavalier' Lead Le Baron Seeks Murphy Republic After Baker Stars Aid Cow's Debut." Los Angeles Times 12 July 1940: A10. ^ "Again the Old Santa Fe Trail". Special to The New York Times, (1923-Current file) [New York, N.Y] 8 December 1940: 188. ^ Schallert, Edwin. "Celebrities En Route to Film Event". Los Angeles Times (1923-Current file) [Los Angeles, California] 13 December 1940: 28. ^ Daugherty, Frank. "Santa Fe Greets 'Trail' Film With a Three-Day Fiesta: Parade of Indian Tribes, Official Reception Held". Special to The Christian Science Monitor, (1908-Current file) [Boston, Mass] 14 December 1940: 4. ^ Churchill, Douglas W. "The Warners Go Tenting on the Santa Fe Trail: And Erudite Indians Obediently Grunt 'Ugh' for Visiting Firemen—Other Items". The New York Times 22 December 1940: 103. ^ "Olivia De Havilland III" The New York Times 15 December 1940: 53. ^ Screen News The Christian Science Monitor 21 Nov 1940: 15. Wikimedia Commons has media related to Santa Fe Trail (film).